My day job's home office is located in the Charm City - Baltimore, Maryland. I do enjoy downtown Baltimore. The architecture is interesting. The people are incredibly interesting. Lot's of history. Edgar Allan Poe stuff. Many raven references. However, bad news is downtown Baltimore is also a coffee wasteland. There's standard corporate fair. There's a local place who sells swill out of dirty coffee pots - and who I'm pretty sure is front for the mob. I'm not even kidding. The first few times I went to Baltimore for work I tried to find alternatives. The best I could do was hotel restaurant coffee. Still not great. But mildly better. Then I found a taste of Paris in downtown Baltimore. The first time I went to Cafe Poupon was for a lunch. I ate the Salade Nicoise and really enjoyed it. Full disclosure: it wasn't what everyone else in my party was looking for. Most importantly, I had an espresso after my salad (in true French fashion) - and was even more happy. The next morning, I returned for morning coffee. They had me at triple shot Americano and a Chocolate croissant. Cafe Poupon seems to be a Baltimore/DC area restaurant - with two locations in downtown Baltimore and another in the Georgetown area. I can only vouch for the Charles St. location. Typically, I am all about locally roasted coffee. But, when one is in downtown Baltimore, one can't be too picky. That said, Cafe Poupon's espresso is perfect. I am thinking there are two factors here. They have a great machine. I honestly don't remember what kind it was, but I did chat to one of the baristas at one point, and she told me they do have a fantastic piece of equipment. Yes - that's anything but local. Illy is a global company who serves shops all over the world. When we lived in Central Asia, one of my favorite shops served Illy coffee. I was surprised when I saw Illy is the brew of choice at Cafe Poupon. The espresso at Cafe Poupon is rich, smooth, and has clarity of flavor with no bitterness - consistently. I've also had a cappuccino with a perfect blend of milk and foam (a bit on the dry side - but I like them that way). Cafe Poupon is a legitimate European style coffee house. Don't forget your pastries. You won't regret it. Get a pastry to go with your espresso drink - they are fresh-made with an artist's touch. I can't recommend the chocolate croissant enough. 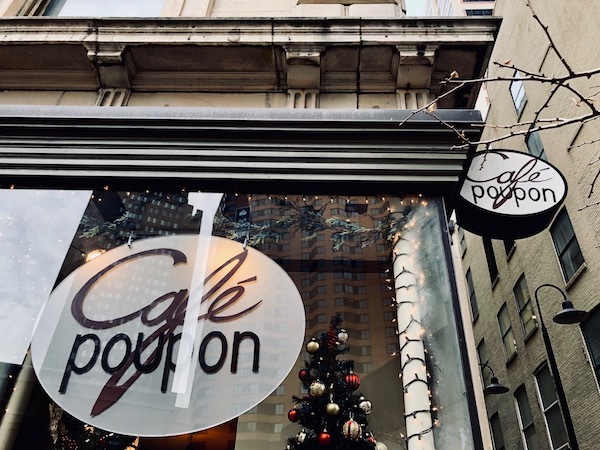 When seeking an oasis in the coffee desert that is downtown Baltimore, Cafe Poupon is a refreshing stop.